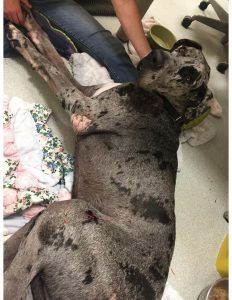 Abstract: Jax, a 4-year-old male neutered Great Dane, was treated with acupuncture for multiple orthopedic and neurologic problems, as well as intermittent hyporexia. His hyporexia responded well to acupuncture while his orthopedic/neurologic discomfort remained fairly static after three acupuncture treatments. Jax, a 4-year-old male neutered Great Dane, was surrendered to the Shelter on 5/5/2017 for suspected left cruciate ligament rupture. No prior medical problems were reported. According to intake exam, patient was ambulatory x 4 but weak in the hindlimbs and had intermittent weight-shifting lameness of all four limbs; his right hip was painful on extension; his right elbow, left carpus, and left tarsus was thickened. His weight was 150 pounds and he was in adequate body condition. Sedated radiographs showed moderate intracapsular swelling and mild osteoarthritis of the left stifle, consistent with reported cranial cruciate ligament injury; both hips appeared normal on radiographs. A CBC and chemistry were performed, which showed a mildly elevated AST of 63U/L (reference range 14-49) and mildly elevated cholesterol of 450mg/fL (reference range 130-339). A urinalysis, urine culture, and 4dx were unremarkable. He was started on 150mg Rimadyl PO BID and a 100mcg/hr Fentanyl patch was placed. During subsequent days, his appetite was inconsistently decreased and required occasional hand-feeding. Joint taps were performed on the left and right carpi, left and right tarsi, as well as the left stifle. Cytology of joint fluid showed degenerative joint disease/chronic synovitis associated with the left and right tarsi as well as the left stifle. No evidence of immune-mediated polyarthritis or septic arthritis was noted. 400mg Gabapentin PO TID was added. I first met Jax on 5/17/217. On physical exam, Jax’s vitals were within normal limits. His neurologic exam was unremarkable (normal conscious proprioception, hopping, tone, and spinal reflexes, normal cranial nerves) aside from pain on cervical extension. Orthopedic exam revealed mild, intermittent weight-bearing lameness of the left hindlimb, as well as discomfort associated with the left elbow and left carpus. No cranial drawer sign or medial buttress elicited from palpation of the left stifle. Myofascial palpation exam showed evidence of cervical and shoulder discomfort, as well as pain around the left hip and stifle; there was tenderness to palpation of the biceps and triceps muscles bilaterally. Medical Decision Making: There are two main goals of my acupuncture treatments for Jax. The first is alleviating pain from his multiple orthopedic and neurologic problems. The second is promoting his appetite by stimulating his GI motility and decreasing any underlying nausea. Main neuromodulation include cervical and lumbosacral spinal nerves, radial and ulnar nerves, femoral and fibular nerves, the sciatic nerve, and stimulating the somato-autonomic reflex. Patient also received massage to help with myofascial tension. Ideally patient should receive laser therapy but laser is unavailable at this time. Patient also received massage therapy in the neck, biceps/triceps, hips, and quadriceps muscles. Patient’s appetite was dramatically better after treatments (patient was eating well on own, without the need to hand feed). However, despite treatments, patient still appeared stiff in the hindlimbs and slow to rise. His neck still appeared tender. On repeated myofascial palpation exams, patient had similar points that were tender to palpation. One confounding factor may be that during the time when patient received acupuncture, his pain medications were adjusted a few times by his primary veterinarians from the shelter (details unknown, but it appeared that his NSAIDs were withdrawn for a few days, and his rimadyl was changed to meloxicam at one point).